Published 11 months of the year, it takes a lot of work to keep it a must read for anyone working within the parking profession and the wider parking community. Working a year ahead we identify the forward features and create the media pack for the year. This makes it easier for advertisers to identify an appropriate issue if they are seeking to reach the parking community with a particular service, product, tender or job vacancy. It is important to not only ensure that there are features for our members but provide our members with a voice too. Two months ahead of each issue we work closely with Cambridge Publishers Limited’s (CPL) editor, Rob Coston to identify the big features and BPA’s presence in the magazine. Our articles often focus on the political landscape and work the BPA is undertaking on behalf of the membership. As editor, my job is about finding, writing and editing a variety of good content from both the BPA and the membership. The BPA has very broad range of members, from private parking operators to Local Authority officials and individual consultants, so Parking News is a challenge to work on, as I’m always trying to include features that will appeal to each of these groups. That said, it’s a lot of fun to get out of the office and meet the people who work in this sector because they are really knowledgeable and passionate about their work – that might come as a surprise to anyone who hasn’t enjoyed close contact with parking professionals! I’m always impressed by the amount of hard work they do to make all of our lives just a little bit easier, so putting pen to paper and helping them to share their stories is a real privilege. But this is only the text we haven’t even discussed the illustrations and design of each magazine! Parking is a practical profession so – understandably – features in the magazine are often illustrated with practical images of car parks. It is important to shake things up and that is what we have seen CPL doing this year. Looking at the image on the left from this year’s June issue CPL’s design lead Zsuzsa Goodyer begins exploring the possible imagery on paper, once she knows the theme and lead feature. By making a number of sketches based on her ideas the editor can then decide the preferred images. It’s important to catch people’s attention, especially if laid out at reception amongst other magazines. Bold colours and a consideration of colour psychology helps artwork stand out. Often the BPA are given a choice of cover designs to choose from. Finally, it is necessary to consider the design in light of the feature space, ensuring it works with the text and adds something to the story. As the design lead for Parking News – I’m constantly thinking of new concepts to describe our features. Content may be key but the first bite is always with the eye. That’s why my role is vital to the continuing development and evolution of Parking News as a publication. Kevin Reed was the art director before me – and left me some pretty big shoes to fill! However, I feel that I’m doing pretty well – bringing you colour and form through multiple media: page layouts, advert design and even animated gifs! It’s my vocation to explore design to inform and inspire. 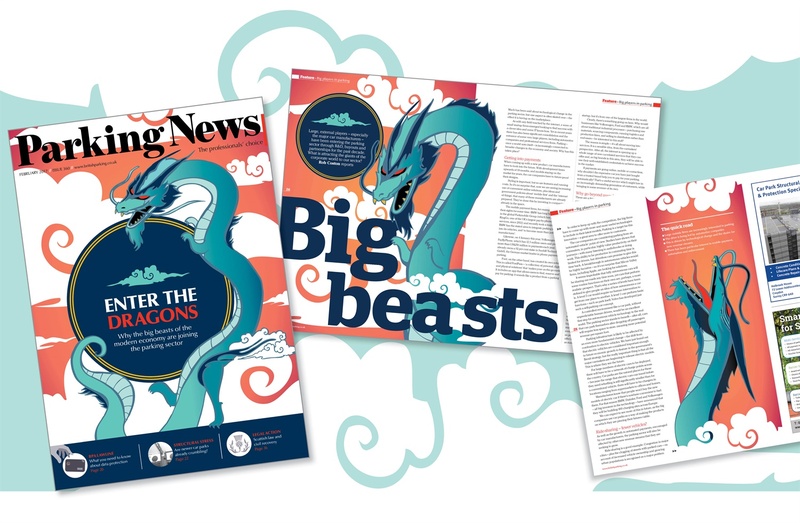 The dragon illustrations featured on this year’s February issue, the article in question was the lead feature – plus an accompanying cover – on the subject of big, new players moving into the parking sector through research and development, buyouts and partnerships. The fantastic illustration has been shortlisted for Best Illustration at the Institute of Internal Communication awards. You can read more about creating the illustrations in Zsuzsa article here, in which she takes you through the step-by-step process of creating these eye-catching dragon illustrations. Once finished the magazine is sent to the printers, then to members and made available online here. The magazine is a legacy of the BPA and parking community, it continues to be a must read and I can safely say that we enjoy creating it, and we hope you enjoy reading it.